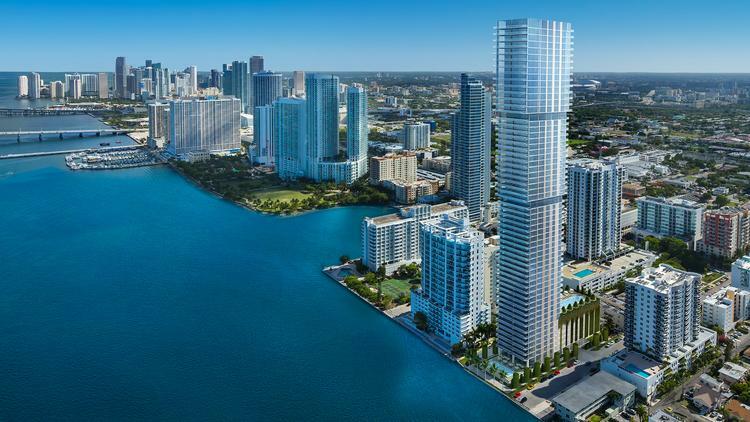 Elysee Residences would rise 57 stories along Biscayne Bay. The Elysee Residences aims to be the tallest condo yet in Miami’s booming Edgewater neighborhood. Two Roads Development recently launched sales for the 57-story project at 700 NE 23rd Street, a waterfront site that currently has a four-story multifamily building. It would have 100 units ranging from 2,660 square feet to 4,000 square feet. Prices starts $1.65 million and some units will exceed $10 million. The average price is $750 per square foot. Elysee is expected to break ground in the first quarter of 2016. Arquitectonica designed the building. The developer hired Jean-Louis Deniot, of Paris, to design the interiors. Amenities in Elysee will include a pool, summer kitchen, fitness center, yoga studio, children’s room, spa with sauna and steam shower, a blow dry bar, a grand dining room, a library, a bar, and a theater. Located just north of downtown Miami, Edgewater has attracted many condo projects, with Melo Group and the Related Group among the largest builders. The towers offer views of Biscayne Bay and they are close to shopping strips in Midtown Miami and the Design District. Two Roads Development is also building Biscayne Beach in Edgewater.